I loved this! I enjoyed every minute - it just ticked all the right boxes for me and I can't wait for more! When Lila uses her ability to prevent being mugged, it scares her and she decides she need to get away. She's desperate to see her brother Jack and his best friend Alex so she jumps on a plane to go see them in California Lila has been secretly in love with Alex for as long as she can remember and she can't wait to see him. But things are not what she expects when she gets there. Who do Jack and Alex work for? And why are they both so determined to protect her? This is such a great balance of action, romance and the paranormal. I love all things psychic so I was like a kid in a sweet shop reading this. And I loved the romance element of the story. Lila and Alex have some major chemistry! Lila is perfect as the narrator as the story - I really liked her even if I did want to throttle her every time she ran away from Alex or Jack! And Alex is all kinds of awesome. He's just soooo hot! And I loved Jack too. The three were really great! I also loved the characters that come into the story later on - I won't mention names as I don't want to spoil anything - but they are equally fab. Great action, an engaging - and unpredictable - mystery, an intense and totally awesome romance, and some great humour. Honestly, what are you waiting for? Read this book! Let’s get one thing out the way first. I live in Bali. It’s basically paradise, with a few more coconuts thrown in for good measure. I live in a house overlooking the rice paddies, cloud-ringed volcanoes silhouetted in the distance, palm trees swaying in the breeze, the taco casa on speed dial – it’s pretty much heaven. Once upon a time I lived in a row of terrace houses in South East London. I had to commute into work every day. I would write in the snatched hours after my daughter was in bed and edit on the train on the way into work the next morning. There were no coconuts. • Went out for lunch with a friend (lunch = two chocolate milkshakes). Life’s a whole lot easier when you a) don’t have to commute, b) get coconuts and frozen margaritas delivered to the door c) don’t have to do your own laundry. I admit there’s a lot of massage involved in my daily life these days. And a lot of sushi too. This was actually a pretty sociable day, but that’s because I’m not writing a book, I’m editing one. And that isn’t quite as absorbing. When I’m in the midst of writing a book (I’ve just finished my fifth) I’m a total recluse and pretty much hermit myself away, talking only to the taco delivery boy and occasionally my family. I wake up at six every morning whatever I’m doing. The first thing I do is turn on my computer to check Twitter, email, Facebook, my blog and Goodreads. Social media addicts could learn something from me. I’m so addicted if you took away my computer I’d probably need to be hooked up to a drip of Valium until you gave it back. If I’m in the middle of writing a book I might sneak out onto the balcony for sunrise and to use the precious minutes before my daughter wakes to pound out another chapter or two. I write very fast – up to 4000 words a day. My last book took just 30 days to complete. Generally I take six weeks between each book to get some headrest because after I finish a book it feels like someone pressed delete on my inner dictionary and I’m pretty much brain dead. I spend the time in between books tinkering with manuscripts, working on edits with my publisher and trying to think up new ideas. Once my daughter’s at school I’m back at my desk, headphones on, listening to music and writing. If I’m not writing a book I’ll be writing something else – a blog post, an email, a Facebook status update, anything. I need to write. It’s an addiction. The times I get stuck on plot or am feeling blocked I’ll go for a swim. It’s the most therapeutic thing I know, swimming under a wide blue sky, watching the butterflies dance. The pool is the place where all my plotting happens. I keep a notebook right by the edge of the pool and will stop and write down whatever comes to me. I do Pilates twice a week too – not because I’m an exercise freak because um, if you saw me you’d know that I’m not, but because I have a really bad back and sitting for hours at a desk really doesn’t help much. Pilates is my only concession to exercise. The swimming doesn’t count as I go so slowly it’s more like floating. I don’t cook. I gave up cooking after my husband decided he didn’t want to buy any more saucepans. I think I’d managed to destroy about six by that point. That frees up time for writing. Most days I either order food in (Sushi or Tacos) or my husband makes something (how lucky am I?). Afternoons are generally spent having to manage a house-load of under fives without resorting to the drinks cabinet. When my daughter’s bedtime rolls around at seven I’m back at my desk, writing some more until I can’t mentally produce another word. And then I’ll generally fall onto the sofa with the husband and watch a movie. But only if he makes his honey sugar popcorn. Though on a Friday I dance ecstatically (ie. Like a lunatic) in a big barn under the stars. Thanks Sarah! How jealous am I - Bali sounds AMAZING!!!! You can find Sarah on her Website and Twitter. She also has the blog Can We Live Here - where she talks about her move to Bali. This sounds like a really good book. (with the ESP and Kinekinesis stuff. )I look forward to putting it on my list! Where you live sounds like a really nice peaceful place to be. I loved Hunting Lila and really enjoyed the day in the life post too! Bali living sounds like an absolute dream! I love Bali so much - it is so friendly and peaceful. Jealous, sounds like a lovely life. 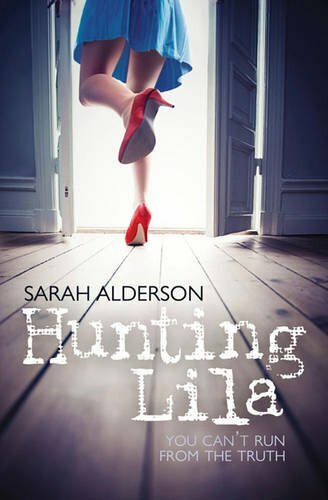 Heard good things about Hunting Lila - can't wait to read it!